Those confusing days are just around the corner, as we get in to March days, and remember, no matter what you think of daylight savings time, it is fast approaching on the March calendar. 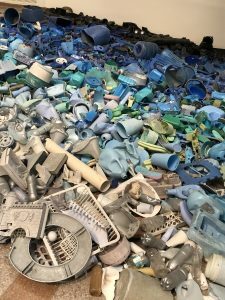 You see two photos here from the Portland Museum of Art exhibit (on view through May 5) called, “Relational Undercurrents: Contemporary Art of the Caribbean Archipelago.” Artist Tony Capellan from the Dominican Republic arrange littered plastic items in this otherwise pretty array of colors, crashing the image you might have of pristine beaches. Also, I wanted to share the sculpture, which stands on a base of an old slide projector with the other elements found washed on another Dominican beach – while a pleasing sculpture, it’s a shame that these items were somehow cast off to end up floating in the ocean and potentially hurting local habitat along the way to the artist’s studio. There are several conferences, workshops and events in March that I will be attending, as part of my goal to meet as many people as I can who share the interests we do at the Lamprey River Watershed Association. I hope you will put a few things on your March calendars that will help you with a similar goal! Check the websites for Red River Theatre, Concord, and the Music Hall, Portsmouth, for their Wild and Scenic Film Festival dates. Check your local sources for the documentary on the negative effects plastics are having on water sources, “The Devil We Know” (which is at the Newmarket Public Library March 13, among other locations throughout NH.) Roundtable discussions follow the screening in most of the sites offering this important film. I’ll have a tic, tac,toe, three events in a row on my calendar, with “The Devil We Know” March 13, then a workshop overlooking Great Bay at the Hugh Gregg Coastal Conservation Center which will be helpful as LRWA moves forward on such things as how to best use funds, and what programming our constituents and supporters are most excited about seeing offered, then the NH Water and Watershed Conference at Plymouth State University. With an overarching theme of community conservation, I will be sharing these ideas through our instagram, twitter and this website along with our e-mail blasts in the coming weeks and months. Outreach to schools in the LRWA towns is about to begin. Students in grades 3-4, 5-6 and 7-8 will have the opportunity to exercise their writing skills and share their ideas about the importance of clean, fresh water. 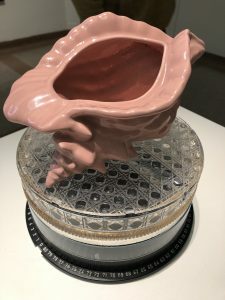 Information about this writing event is shared with the school administrators and teachers – with the idea that come April, LRWA can further share the student ideas with the public who can see the importance children see in the Lamprey River as an important resource. We’ll share some of this writing as our tribute to Earth Day in late April. It’s all the more important to stay safe as you explore river banks, maybe looking for the first skunk cabbage or other early signs of spring. Rocks and river banks can be very slippery, and your journey out on a late winter, or early spring day, shouldn’t find you ending up unpleasantly wet from a mishap as you investigate the nature around us. Follow LRWA on Instagram with lampreyriver or on Twitter @LRWA. Imagine A Day Without Water!!! Imagine a how difficult it is to not have access to not only clean water but any water at all! How can you save water? Download our tips. See how our story began and view other videos on our YouTube channel. 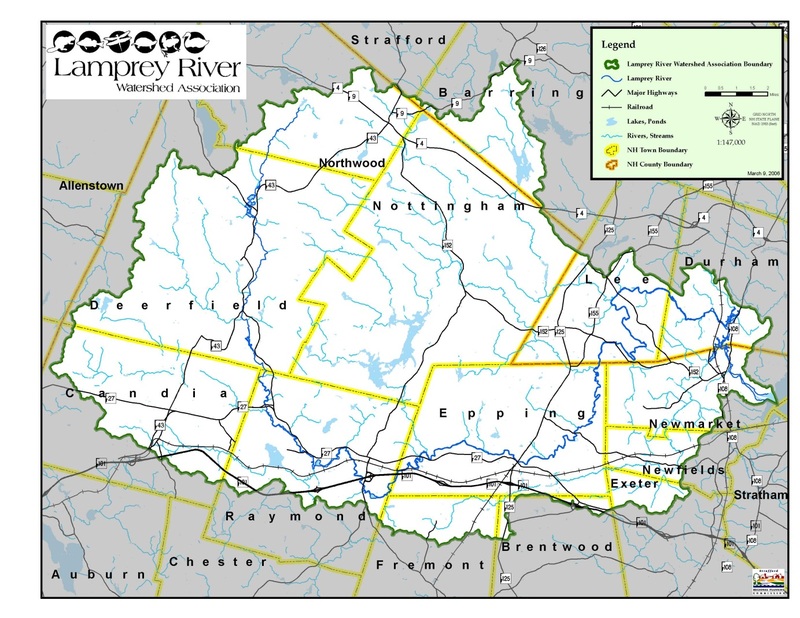 The Lamprey River Watershed Association (LRWA) was formed in 1983 to promote the restoration, conservation, wise development and use of the natural resources of the Lamprey River Watershed. Conserving fish and wildlife, forests, soil and water resources along with pollution abatement are key goals of the Association. Through education and research, the LRWA will work to increase the understanding among citizens about the importance of water and land conservation in the watershed. 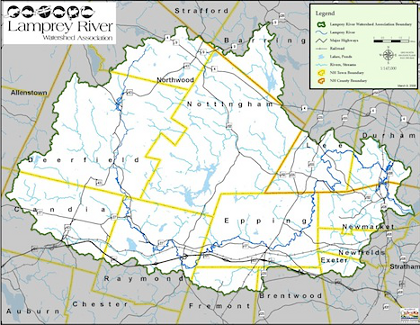 The Lamprey River Watershed Association works in partnership with other conservation organizations and citizen groups to maintain or improve the natural health and beauty of the watershed. The Lamprey Watershed Association, Inc. is a non-profit 501 (c) (3) organization. LRWA Board of Directors – meetings are on the second Monday of each month at 5 pm at the Lee Safety Complex. Public welcome. Prospective board members encouraged to contact LRWA at volunteer at lrwa-nh.org. All skills can be put to good use helping to make our watershed sustainable!